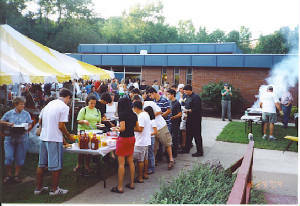 It was the first weekend of the fall semester and the smell of barbeque wafted down North Eagleville Road. 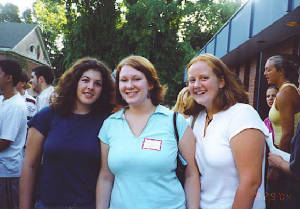 On Sunday, August 29, 2004, after a very well-attended 5 pm mass, many people gathered for the annual Welcome Back Picnic. 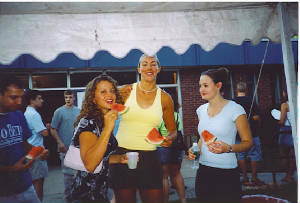 Over three hundred people enjoyed hot dogs, hamburgers, watermelon, and each other's company. It was a fun time for friends to come together after a long summer as well as a great opportunity to meet new people and to get a "taste" for what St. Thomas is all about, especially for all the newcomers.